At least 50 people have died and 170 have been injured in wildfires ravaging woodland and villages in the Athens region, as Greek authorities rush to evacuate residents and tourists stranded on beaches along the coast on Tuesday. The death toll soared with a Red Cross official reporting the discovery of 26 bodies in the courtyard of a villa at the seaside resort of Mati. The bodies were entwined and severely burnt, an AFP photographer at the scene said. They appeared to have been caught by the flames trying to reach the sea. The authorities had previously announced 24 deaths and scores of injuries with the majority of casualties found in their homes or cars in Mati, 40 kilometres (25 miles) northeast of the capital. Of the injured, 11 people were in serious condition. Port authorities told AFP they had found four bodies in the sea, including three women and a child who had apparently tried to escape the flames. There were fears the toll may rise further, as people remained unaccounted for. Interior Minister Panos Skourletis said rescue workers were “still searching if there are more missing”. “It’s a national tragedy,” civil protection agency official Ioanna Tsoupra told public broadcaster ERT. By dawn Tuesday, fires were still burning around the capital, while others broke out elsewhere during the night. Authorities were trying to evacuate inhabitants, government spokesman Dimitris Tzanakopoulos said. “Fifteen fires had started simultaneously on three different fronts in Athens”, he said, prompting Greece to request drones from the United States, “to observe and detect any suspicious activity”. Nine coastal patrol boats, two military vessels and “dozens of private boats” assisted by army helicopters were mobilised to help those stuck in the harbour in Rafina, one of the worst affected areas close to Mati. Evacuees were transferred to hotels and military camps, while worried relatives flocked to the area. Civil protection chief Yannis Kapakis said he had told Prime Minister Alexis Tsipras, who cut short a visit to Bosnia to return home, that winds up to 100 kilometres (60 miles) an hour were creating “an extreme situation”. Forecasters said conditions would remain challenging on Tuesday, although showers and falling temperatures were expected in Athens. In the north, more than 300 firefighters, five aircraft and two helicopters were mobilised to tackle the “extremely difficult” situation, Athens fire chief Achille Tzouvaras said. 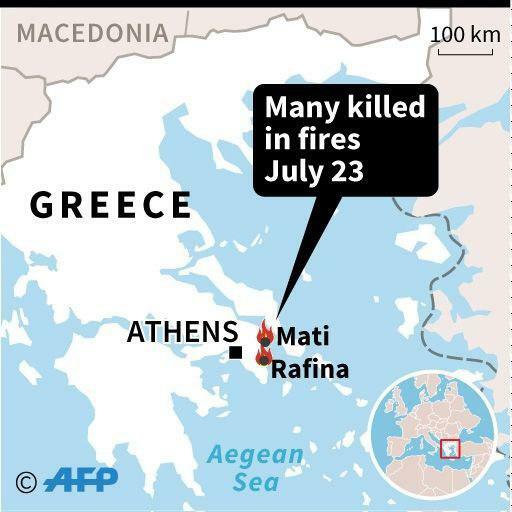 Video footage showed inhabitants fleeing the fires by car, with several buildings and homes damaged, as the region of Attica — which includes Athens — declared a state of emergency. “If I hadn’t left, I’d have been burned,” a 67-year-old resident named Maria told AFP. Near the town of Marathon, residents fled to safety along the beach, while 600 children were evacuated from holiday camps in the area. “I am really concerned by the parallel outbreak of these fires,” he said, with officials raising the possibility they could have been started deliberately by criminals out to ransack abandoned homes. 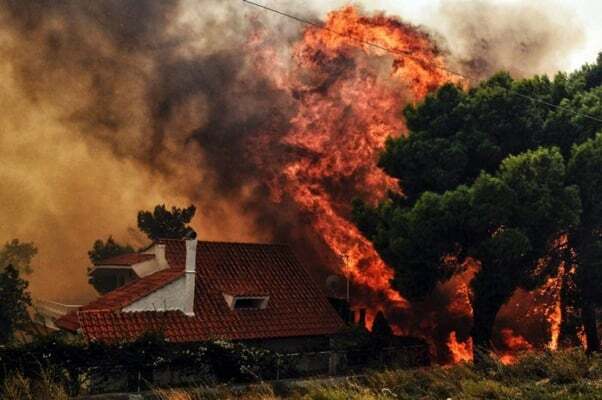 Fires are a common problem in Greece during the summer and can be major killers. The Greek government has asked the European Union for help fighting the fires. In recent days, wildfires have also caused widespread damage in northern Europe. Sweden is experiencing an unprecedented drought and the highest temperatures in a century. On Monday, the Nordic nation’s civil protection agency MSB said there were 27 active fires across the country, as temperatures were expected to soar as high as 35 Celsius this week. Several European countries including France, Italy and Germany have sent planes, trucks and firefighters to help tackle the blazes in Sweden, where usual summer temperatures are closer to 23 Celsius.